Iraqi Shiite cleric Muqtada al-Sadr addresses his supporters during a demonstration in Baghdad in 2017. He is now aligning himself with Communists ahead of Iraq's May election. Portraits of Muqtada al-Sadr, his father and father-in-law are painted on a wall in Sadr City, a district of Baghdad. An estimated 4 million people live in Sadr City, known as Saddam City before Saddam Hussein was toppled in 2003. 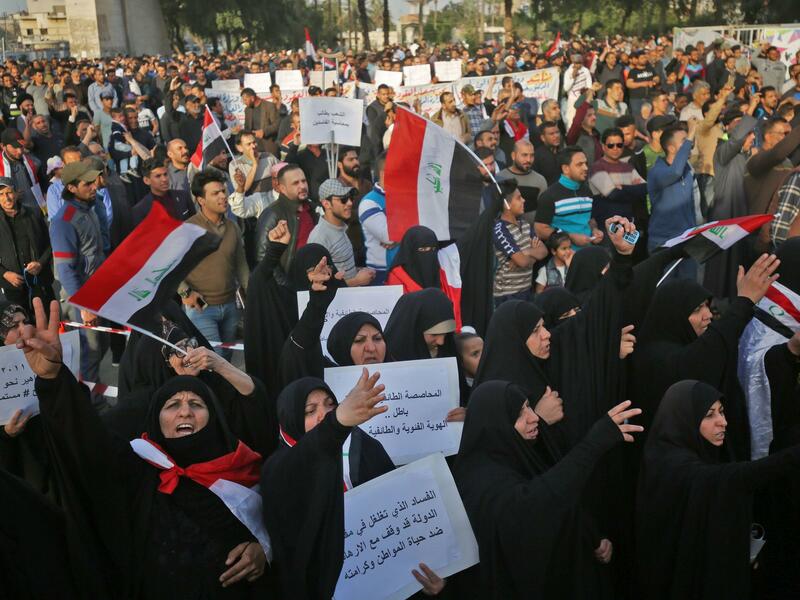 Iraqi supporters of Muqtada al-Sadr shout slogans and wave national flags as they demonstrate in Baghdad against corruption in the Iraqi government on March 2. Now, preparing for elections in May, the Shiite cleric venerated by millions of religious followers is forming a brand-new alliance with Communists and secularists. "We have to face it," says Dhia al-Asadi, head of the Ahrar bloc, the Sadr movement's political wing. "What destroyed our country ... is groups or parties allied along sectarian or ethnic lines." Sadr, while holding no official position in government or politics, remains one of the most powerful figures in Iraq, able to bring hundreds of thousands of followers into the streets through his family's religious legacy. His political evolution could have far-reaching consequences for the next Iraqi government, the country's fractured Shiite political class and Iraq's relationship with neighboring Iran. In Iraq, the new alliance asks Sadr's followers to take a major leap of faith in abandoning religion as a basis for voting. Since the country's first postwar parliamentary elections in 2005, Iraqis have mostly voted along sectarian and ethnic lines. And Sadr owes his huge following largely to his family's religious legacy. "Sayid Muqtada al-Sadr believes it is not the role of any politician to spread Islam or religious teachings," says Asadi, an urbane, Iraq- and U.K.-educated academic. "This is maybe seen by some as a departure from the religious ideas" of the cleric's father and father-in-law, he says. Asadi terms it a gradual transformation. In Sadr City, on the outskirts of Baghdad, trash-strewn streets and open sewers testify to government neglect, despite the election of more than 30 Sadr movement members to parliament and several cabinet posts. Before 2003, the sprawling, working-class neighborhood of Sadr followers was known as Saddam City. Protests — quickly crushed by Saddam's government — erupted here when Sadr's father was killed in 1999. As in the rest of Iraq, disillusionment with Iraqi politics runs deep. "I'd rather vote for a Sunni," says Sabrin Hashem, a young housewife shopping on a street with posters of Sadr's father and father-in-law. "It's been how long? Fifteen years? We haven't seen anything from a Shiite government," says Hashem, dressed in the enveloping black cloak that most women here wear outside the home. The Sadr name commands a following based on both religion and pragmatism. The cleric's late father, Grand Ayatollah Mohammad Sadiq al-Sadr, is credited with reviving messianic sentiment among Iraqi Shiites. Followers believe the Prophet Muhammad's 12th successor disappeared in the Iraqi city of Samarra more than 1,000 years ago and will return to herald judgment day. The younger Sadr also inherited a legacy of social activism and services for the Shiite poor and dispossessed — a legacy jeopardized in recent years by corrupt members of his own political faction. In response to the corruption, Sadr ordered a sweeping purge and banned all his current members of parliament from running in May's election. He said he wanted to inject "new blood" into the process. "People are saying this is not going to work," Asadi says of the alliance with the Iraqi Communist Party, made up traditionally of atheists. But Asadi doesn't agree: "I think this is going to succeed because they share the same principles, to a certain extent. They come from the same social classes, they fight for the same values and they share the same history of oppression and suppression by different regimes." 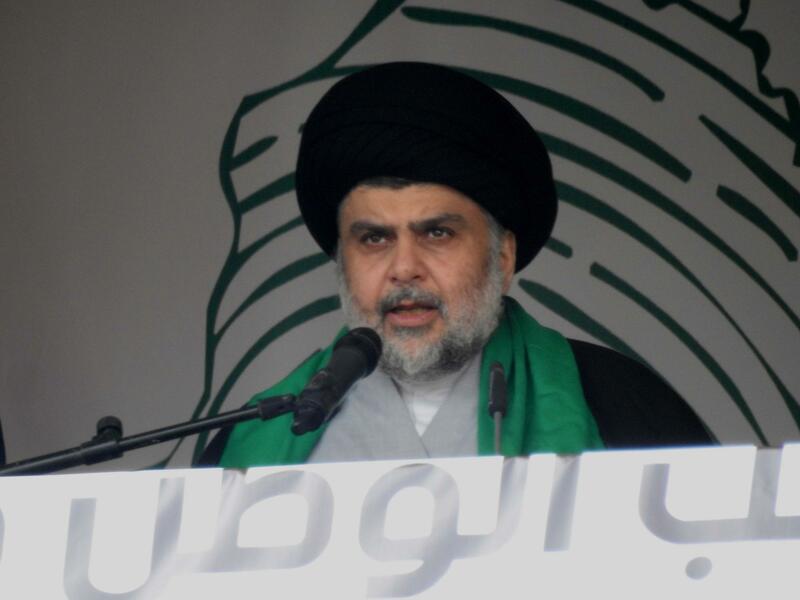 The alliance puts Sadr further at odds with Iraq's powerful neighbor. Ali Akbar Velayati, the former Iranian foreign minister who is a top aide to Iran's supreme leader Ayatollah Ali Khamenei, recently visited Baghdad, warning Iraqi officials it would be unacceptable for Communists to be in government. In contrast with the Iranian-backed militias that were assembled to fight ISIS when the Iraqi army collapsed four years ago, Sadr increasingly portrays himself as an Iraqi nationalist. He has reached out to Saudi Arabia — which is gradually warming up to Iraq after a decade of hostility to the country's Shiite-led government — to try to lessen Iraq's isolation in the Arab Gulf countries. 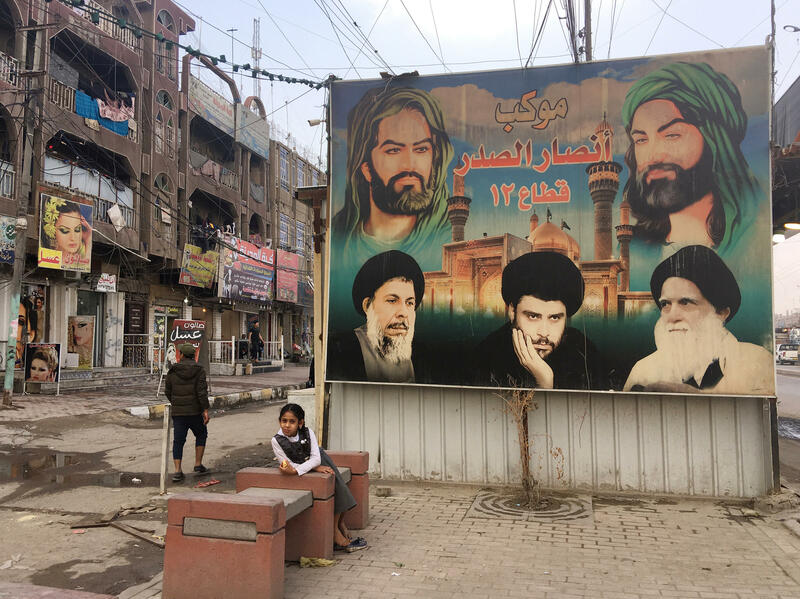 "That's why Sayid Muqtada al-Sadr visited Saudi Arabia [last summer] — to tell them that the Shiite of Iraq are not going to be an extension of the Iranian revolution," says Asadi. "His visit was to ask them to be more present in Iraq," he adds, referring to a greater diplomatic and economic investment in the country. Iran is not happy with the cleric, Asadi acknowledges, but he says Sadr's role in opposing U.S. intervention in the region — the same stance as Iran — prevents Tehran from opposing him outright. Sadr has taken the same stance against Turkey and Russia, Asadi says — warning them not to intervene in Iraq. Implicitly, in demanding that all foreign forces leave, he has also called for the removal of Iranian fighters. His opposition to Iranian influence puts Sadr in rare agreement with the United States. 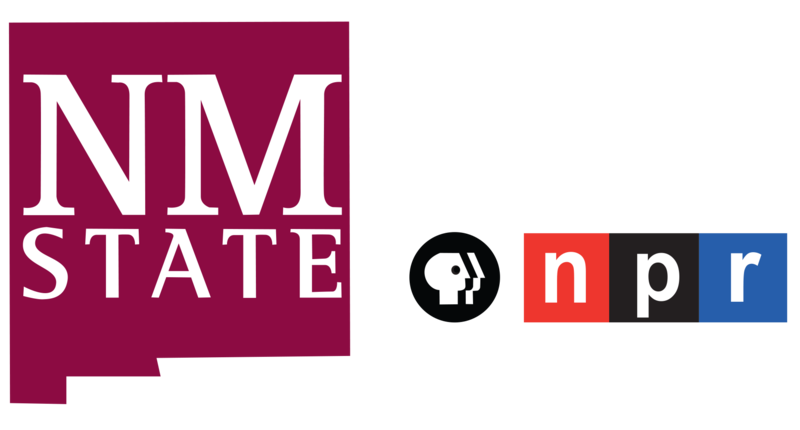 "He's become an Iraqi nationalist as opposed to an Iraqi Shiite Islamist," says Robert Ford, a former U.S. ambassador who served in Iraq as deputy chief of mission. "I don't think it's American policy to try to dominate Iraq. We simply would like it to be sovereign and independent rather than a vassal state of Iran next door so if Sadr can promote that, it's in line with American policy objectives." In 2004, with U.S. occupation authorities in charge of Iraq, Sadr formed a militia to fight American forces, stepping into the security breach created when the U.S. disbanded the Iraqi army. Sadr named it the Mahdi Army, evoking the 12th imam, whose promised reemergence would herald salvation. He sent militia members to Fallujah to fight alongside Sunni fighters battling U.S. forces there. The U.S. military, acting on an Iraqi arrest warrant, vowed to capture or kill him. In the sectarian war that followed, Mahdi Army leaders were accused of running death squads in Sunni areas. Sadr officials point out the cleric was in Iran for much of that time, and now say those fighters were not under his control. Sadr eventually agreed to a cease-fire in his battle against U.S. forces and U.S.-backed Iraqi troops. He returned from Iran after American forces withdrew from Iraq in 2011 and replaced his militia with a social services organization. He reactivated the fighters in 2014 — creating the "Peace Brigades" to protect Samarra against ISIS. The same paramilitary force shot and killed a top security aide to Prime Minister Haider al-Abadi in March, when he failed to stop at one of their checkpoints. "Even today, it's not clear that Muqtada al-Sadr has day-to-day tactical control over his militias," says Ford, now at Yale University and with the Middle East Institute. "I think the Iraqi government has a real problem with different militias, both Shiite and Kurdish and Sunni. How the Iraqi government tries step by step to assert more control over these troops will be a major factor in the development of Iraq over the next couple of years."